Orange crocosmia and cannas fringe the path leading to the thatch-roofed shed. A storage shed can be as attractive as it is functional. 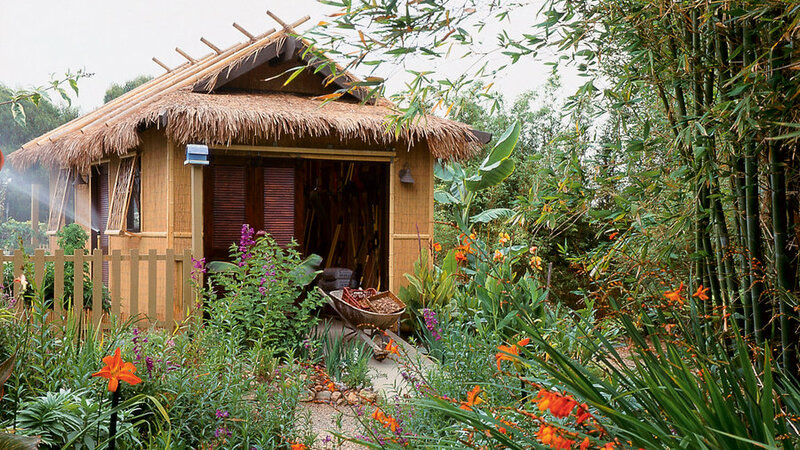 This one―a 220-square-foot rectangle inspired by a Polynesian dwelling―complements the tropical landscape in Bobbi and Gene Hirschkoff’s Encinitas, California, backyard. It serves as a focal point among tropical plants and is also a storage place for garden tools and equipment. To enhance the jungle setting, Bobbi bordered pathways leading to the shed with agapanthus, calla lilies, cannas, crocosmia, daylilies, ginger, and watsonia. The shed, constructed of 2-by-4s and plywood, incorporates two skylights, three windows, a regular door, and two sliding barn doors (each 6-ft. slider is made up of two 3-ft. louvered doors from a home improvement center). Decorative exterior siding of 1/4-inch bamboo slats (sold by the roll as fencing), as well as the roof’s palm thatching and 4-inch-diameter bamboo poles, are from Solai (619/276-1386), a San Diego company that imports bamboo products.